Legacy Christian senior Zach Zesiger is hit by a pitch in the third inning of an April 1 game against visiting Yellow Springs at Grady’s Field in Xenia. Zesiger was hit by a pitch three times in Monday’s home loss. Yellow Springs starting pitcher Dylan Rainey scattered three hits in five innings of work, with seven strikeouts, in Monday’s eventual 14-1o Bulldogs win over host Legacy Christian. Junior first baseman Colton Bittner of Yellow Springs makes a stop for a groundout to record the very first out of Monday’s Metro Buckeye Conference game against host Legacy Christian, in Xenia. 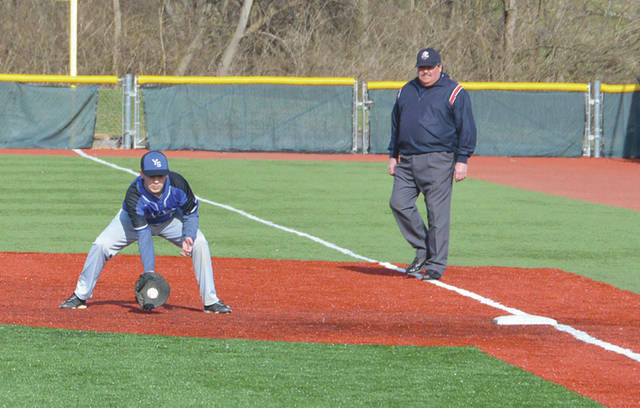 Bulldogs pitcher Dylan Rainey scoops up an infield grounder for an out, April 1 at Grady’s Field in Xenia. 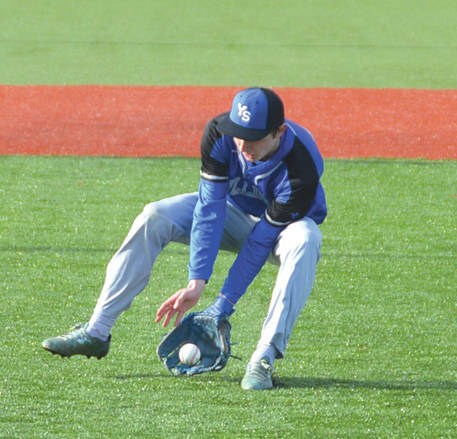 XENIA — It’s early in the 2019 high school baseball season, and that unfamiliarity showed on April Fool’s Day. Visiting Yellow Springs and host Legacy Christian combined for at least a dozen wild pitches, 26 walks, six hit batsmen, 19 strike outs, eight errors, and 24 runs in a frigid 14-10 Yellow Springs win at Grady’s Field on the Athletes In Action Sports Complex grounds. The win was the first for Yellow Springs coach Ryan Pasco. Rainey limited Legacy Christian to three hits through his five innings of work. He recorded eight strike outs, while walking five. He only hit one batter, but he hit that same batter — LCA’s Zach Zesiger — three times. Three Yellow Springs relief pitchers accounted for nine walks the rest of the way. Rainey had two infield hits, reached on an error and got on after being hit with a pitch, scoring twice for Yellow Springs. Senior Trey Anderson doubled to drive in one run, and walked with the bases loaded to bring in another. Legacy led 5-3 after three innings of play, Springs tied things up in the top of the fifth, but the host Knights responded with two runs in the bottom of the fifth to lead 7-5 after five innings of play. In the sixth, however, the Bulldog bats came alive. Romel Philips, Tariq Muhammad, Rainey, Anderson and Eric Hansen each got hits in the inning, with Anderson’s being a double. Colton Bittner and Blaine Baker each got on with a walk. Philips, Muhammad, Rainey, Baker, Anderson and Hansen all scored in the inning. The Bulldogs then tagged on runs by Baker, Jasiah Zingor-Mitchell and Hansen in the seventh to stay out front for good. Legacy scored two in the bottom of the sixth, and another in the bottom of the seventh, but ended the game with two runners stranded on base. 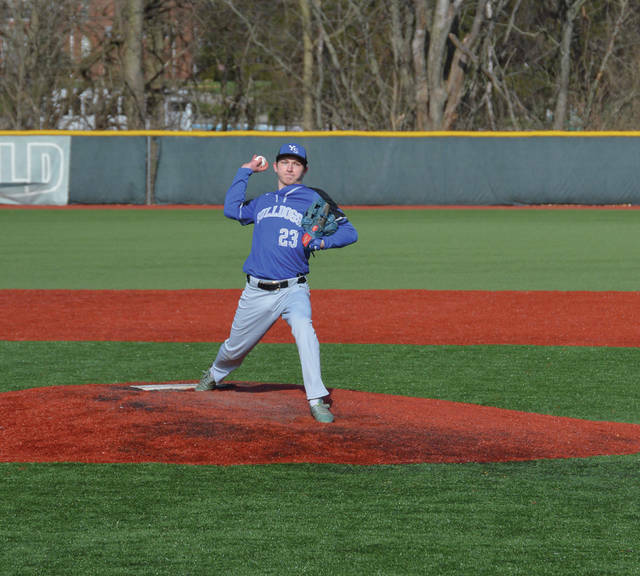 Sophomore starting pitcher Ty McIntire is one of those guys “coming along.” McIntire limited Yellow Springs to a Rainey infield single through the first three innings of the game, but then walked one batter and hit the next two in the fourth to end his day. McIntire struckout five Bulldogs, but walked seven others. “His ERA is not as bad as it looks like, but things happen behind him, so …” Pickens added. With the loss, Legacy Christian is now 0-4 overall, 0-3 in the Metro Buckeye Conference. Yellow Springs was playing in its regular season opener on Monday, so they’re now 1-0 overall and in the MBC. 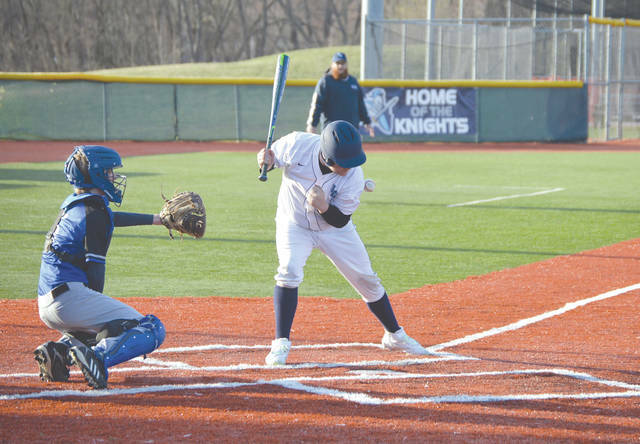 The Knights head to Springfield to take on Emmanuel Christian for a 5 p.m. contest on Tuesday, April 2; Yellow Springs heads north to take on Troy Christian at the Eldean Baseball Complex at that same time.